Presenting our ABS CLiC-iT model for usage at heights: Watch our short product video to find out more about its most important features! This lightweight, twin connector (weighs less than 2 kg) consists of 2 matching carabiner hooks and provides uninterrupted rope-up protection. It is impossible to accidentally open up both hooks at the same time. This mobile solution can be used in industrial applications, scaffolding work, wind farms and other similar fields of activity. 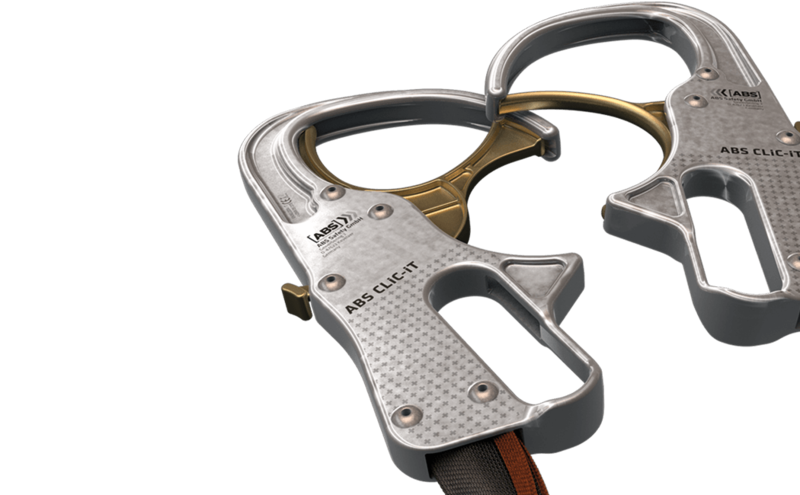 Our practical ABS CLiC-iT connector provides interruption-free fall protection. What makes this device so special is its two inter-communicating carabiner hooks: As long as one of the hooks is still open, the second cannot be accidentally released. ABS CLiC-iT greatly reduces the risk of falling through lack of concentration. The carabiner hooks of this ABS CLiC-iT system are specially adapted to lateral loads, opening up a broad array of applications. Apart from conventional usage in a horizontal lifeline system, this connector also offers you special protection in an industrial environment or during scaffolding work. The system is suitable for both horizontal and vertical usage and offers reliable safety protection for any load-bearing structure. 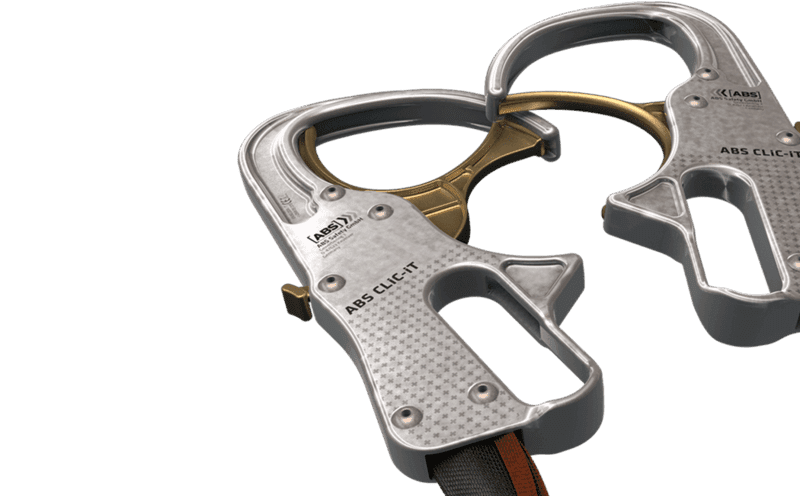 Our ABS CLiC-iT carabiners have a large opening and not only fit around rungs and horizontal bars but can also be hooked onto pipes up to 60 mm in diameter. Due to its lightweight design (only around 2 kg), you can take the ABS CLiC-iT with you virtually anywhere - providing you with a practical alternative whenever you need a temporary solution. In the case of a fall, the integrated energy absorber minimises the ensuing force. All you have to do is to connect our ABS CLiC-iT to your safety harness - just like any other standard lanyard. Our ABS CLiC-iT system is certified in accordance with EN 362:2004 ("Personal protective equipment against falls from a height - connectors") and EN 355:2002 ("Personal protective equipment against falls from a height - energy absorbers"). Of course, we can also supply a matching safety harness: Our ABS Comfort scores top marks for its practical quick release fasteners. It is suitable for loads of up to 136 kg (user, incl. clothing and tools).